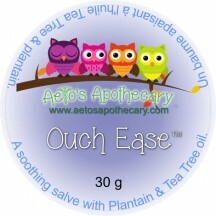 Stuff-Ease is a soothing essential oil blend with Eucalyptus. Our Whipped butter blend with lemon, lavender, neroli, mandarin, tea tree, and eucalyptus to sooth colds and runny noses. Prior to 6 months this balm may be applied to an adult who is holding the child for feedings. Apply a small amount to back, chest, feet and forehead. Contains: Coconut oil, Shea butter, Avocado butter, Hemp seed butter, Lemon butter, Eucalyptus globulus, Melaleuca alternifolia, Citrus reticulata, Lavandula angustifolia, Citrus aurantium amara.